Reuven Rivlin joined by haredi soldiers for candle lighting on first night of Hanukkah festival. 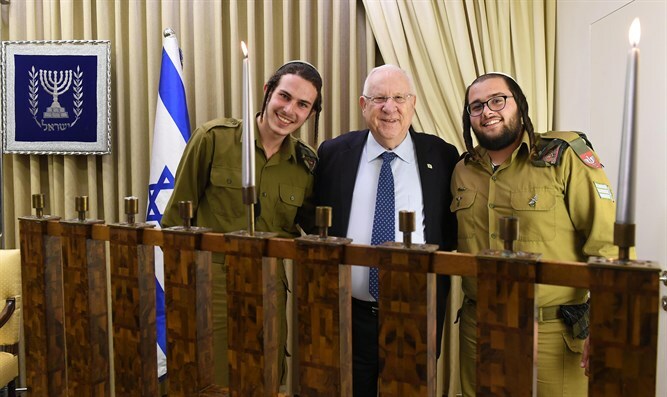 President Reuven (Ruvi) Rivlin lit the first candle of Hanukkah this evening with soldiers from the haredi formations of the IDF – the Tomer battalion of the Givati Brigade, the Hetz company of the Paratroops Brigade and the Netzah Yisrael battalion of the Kfir Brigade. Brigadier Eran Shani, head of the planning and administration division of the Manpower Directorate and head of the ultra-orthodox administration, Lt-Col Telem Hazan also participated in the ceremony. Some 7,400 haredi solders serve as officers and solders in the IDF. There has been an increase of 10.5 times in the number of haredi enlistees.